Whether you are a high school athlete, a full-time worker, or a stay-at-home parent, an anterior cruciate ligament (ACL) tear can seriously interfere with your daily activities. Luckily for Houston area residents, patients suffering from a torn ACL can turn to K. Mathew Warnock, MD for treatment and surgery. Specialized in ACL and knee repair, Dr. Warnock will evaluate your condition and discuss potential treatment options. The anterior cruciate ligament is one of the four main ligaments of the knee. This ligament crosses from the underside of the femur to the tibia. The ACL is a vital part of the knee because it stabilizes the leg and prevents hyperextension. Those who perform a lot of running, kicking, or movement rely on the ACL to keep their bodies grounded and stable during activity. An anterior cruciate ligament injury is a Grade 3 sprain that threatens to throw off an individual’s rotary stability and damage knee function. This knee injury often occurs when athletes plant their foot hard on the ground, or when individuals keep stiff, straight knees while landing from a fall or jump. While all active individuals are at risk of tearing their ACL, women are three times more likely to experience the injury. One telltale sign of an ACL tear is a popping sound and swelling after impact. Those with this injury also experience pain when bending the knee and the buckling and locking of the knee during movement. Doctors have several tests at their disposal to evaluate the severity of a knee injury. During a clinical examination, a physician may use the pivot-shift test, the drawer test, or the Lachman test to evaluate the knee. All of these tests involve moving the leg or knee into various positions and testing its stability, an important indicator of an ACL tear. Clinical examinations are accurate when administered by experienced hands, but patients also have the option to confirm their diagnosis with an MRI. Using an MRI to confirm test results also allows the doctor and patient to view the tear and any other part of the knee that may be contributing to the injury. A small percentage of cases do not require surgical reconstruction to heal the ACL. These patients are often older and less active, and wearing a knee brace is sufficient to promote healing. In most cases, arthroscopic ACL surgery is necessary to fix the damaged knee. This procedure uses an autograft from the patient’s body or an allograft from a donor to patch the torn ligament. The surgery is usually performed by an orthopedic surgeon, who makes small incisions in the knee. The surgeon then inserts an arthroscope, drills, and the chosen graft through the incisions in order to view and manipulate the inner knee. Many doctors favor this procedure because of its enhanced visibility and decreased risk to the patient. Dr. Warnock is board-certified in orthopedic surgery and a member of the American Society of Orthopedic Surgeons. To affirm his expertise in the field, Dr. Warnock has completed a knee and shoulder fellowship and published several scholarly articles. He is also fluent in Spanish and Portuguese. 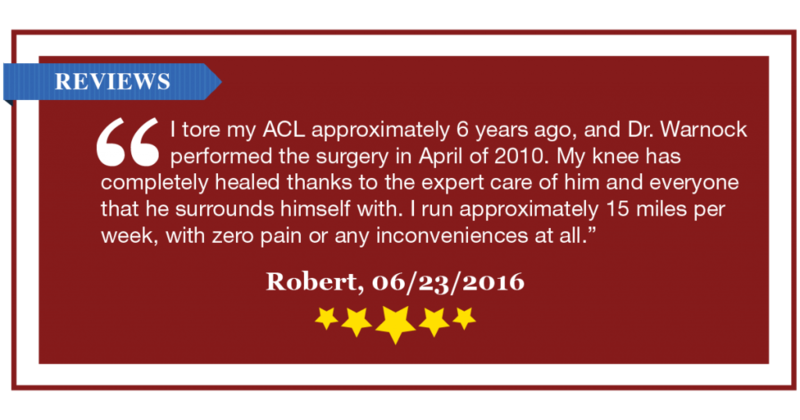 Houston residents can depend on K. Mathew Warnock, MD to treat their ACL tears with unparalleled professionalism and expertise. If you believe you have an ACL tear, Dr. Warnock can be reached at 281-807-4380 or through the online form at the bottom of this webpage.